Posters make an awesome graduation gift for a college student. With online tools such as PosterMyWall it is now super easy to collect a few photos and make them into a poster to give as a gift. PosterMyWall even offers easy printing services for different size posters. So get your creative hat on and follow the tips below to make a gift straight from the heart! Go through your graduate’s photo albums and pick out a few photos celebrating different stages of their life. They’re sure to bring back nostalgic moments and more than a few laughs. Find photos from important school events such as sports or receiving special awards. Let these photos remind your child that they were always your rising star. Find images of the college mascot, logo, or motto and place those on the poster with the year your child is graduating in. All of these make a greater central focus point around which you can place all your photos. 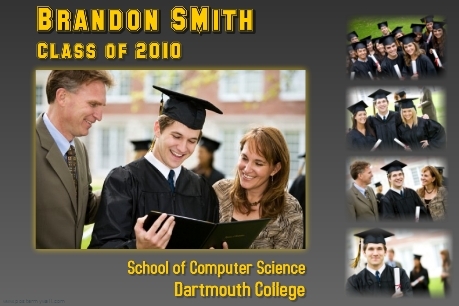 Not sure how to make a poster for the Graduation Gift? Take a Tour of PosterMyWall to view the simple step by step guidelines on how to customize your own poster. Browse through the Public Gallery at PosterMyWall to get inspired from other user’s posters. Join us on our Facebook Fanpage to find out about our latest news and promotions, ask questions, get ideas and share your own thoughts! May 5 Fathers Day posters!